How do we know at least 1,150,000 Jews were murdered by the Einsatzgruppen and their collaborators? The number of Jews murdered by the Einsatzgruppen is much, much lower than the 1,000,000 estimated victims. These figures are impossibly large. There is no statistic basis for the claim that the Einsatzgruppen extermination a million Jews. The crimes of the Einsatzgruppen are the best documented of the Holocaust. In addition to survivor, bystander, and perpetrator eyewitness testimony, there is physical evidence in the form of graves and bodies. There are also photographs and we have a nearly complete series of Einsatzgruppen reports (of 195 reports only one is missing). At the time of the Einsatzgruppen trials, the number of Jews that the Einsatzgruppen murdered was placed at a minimum of 1,000,000. Modern research has shown that it is closer to 1,150,000. What do some Holocaust deniers specifically say? Page 6 of Jager Report. Bundesarchiv, Bild 183-B0716-0005-007 / CC-BY-SA 3.0, via Wikimedia Commons. Benjamin Ferencz, the Chief Prosecutor in the Einsatzgruppen trial, added up the number of victims in the 194 Einsatzgruppen reports. Some of the reports did not clearly list the number of Jews murdered. For instance, some simply stated that a town or area was “free of Jews.” Ferencz added up all the listed numbers and used the number ‘1’ for any description of murder that had no specific number. He found that the numbers totaled over 1,000,000 Jewish men, women, and children. Given the way Ferencz had to count vague entries, it is clear that the number is higher than one million. The total number of Jews murdered is at least 1,152,731 across the four Einsatzgruppen units and the Higher SS and Police Leaders. It is important to remember that these numbers refer to all the victims, not just the Jews, although the vast majority of them were Jewish men, women, and children. The above number does not reflect all possible victims. It does not include the majority of the murders committed by local collaborators, under the control of the Einsatzgruppen, civil administrations, or the Romanian and Hungarian armies. Further, the figures do not include about 1,000,000 other Jewish victims from the East. Whether in the ghettos or camps, the Nazis killed such victims in different ways: worked to death, died from disease, or died from starvation. Most responsible Holocaust scholars think that the Nazis murdered up to about 2,500,000 Jews in the East. 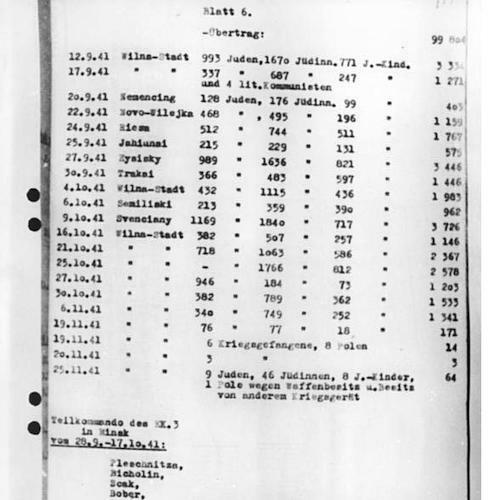 The figures from the Einsatzgruppen and the Higher SS and Police Leaders shows that they murdered at least 1,152,731 people, the vast majority of whom were Jewish men, women, and children. Jürgen Graf, The Giant With Feet of Clay: Raul Hilberg and his Standard Work on the “Holocaust,” p. 40 at http://vho.org/GB/Books/Giant/Chapter5.pdf. Richard Harwood, Did Six Million Really Die? Trust at Last—Exposed (Part 4 of 9), (“Action Group Executions Distorted”) at http://www.zundelsite.org/harwood/didsix00.html#4. For a scholarly and complete study of the number of Jews murdered see Ronald Headland, Messages of Murder: A Study of the Reports of the Einsatzgruppen of the Security Police and the Security Service, 1941-1943 (Fairleigh Dickinson University Press, 1992), pp. 92-100. Ronald Headland, Messages of Murder: A Study of the Reports of the Einsatzgruppen of the Security Police and the Security Service, 1941-1943, p. 174.